1. 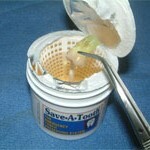 Save-a-Tooth Place avulsed tooth into Save-a-Tooth solution (do not rinse off the tooth). 2. Advise patient to see dentist ASAP and to bring solution with tooth in it.